China is on the "wrong side" on the issue of religious freedom, a fundamental human right, US Secretary of State Mike Pompeo has said stressing that America was opposed to "religious intolerance" in any country whether it is an ally or not. At the State Department's three-day conference next week on religious freedom, the US will be making the case that religious freedom benefits countries economically and diplomatically, Pompeo said. The summit will bring together government officials, representatives of international organisations, religious leaders, rights advocates and members of the civil society from around the world. Pompeo said that the Trump administration is considering taking multiple actions against Myanmar on the Rohingya refugee crisis. 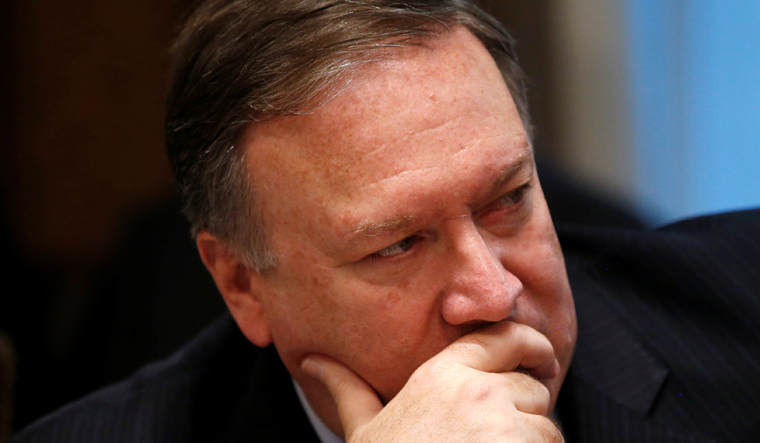 "The State Department has made it clear that with respect to this issue (religious freedom), we think they (China) are on the wrong side of religious freedom, that they are a country of concern connected to that," Pompeo told VOA news. He said the US believes that "religious intolerance is unacceptable" and aims to promote religious freedom in every country, whether or not it is an ally. He was responding to a question on repression against the Uighur Muslims and Tibetan Buddhists in China. "We understand that religious freedom is at risk in many places in the world, and yet the US has complex, broad relationships with many countries, including China, across economic and military and political sets of issues," he said. Pompeo said that the US puts religious freedom, this fundamental human right, at the very centre of its discussions with every country with whom it interacts. "The Trump administration has been incredibly strong in promoting religious freedom. It is the case that there are many countries, indeed countries that we often work alongside, who are allies in other places, we work to demonstrate to them that religious tolerance and freedom is good for them," Pompeo told EWTN Television network. US Vice President Mike Pence would deliver a key note address at the conference next week. The issue of religious freedom in India, including some recent incidents of violence, is expected to be raised during the conference, informed sources said. The conference, Pompeo said, will be laying out a path where the US can lead a process where religious freedom is raised as a priority for the citizens of every country. "We will have our teams in the subsequent weeks and months in the field talking about religious freedom on a continued basis," the Secretary of State said in another interview to FRC Radio. Religious freedom, he said is good for their country; it's good for their government. "It'll bring investors; it'll make their people more productive. We think these are all this fundamental human right, this concept that every individual ought to have the right to practice their own faith, we think makes their countries stronger too," Pompeo said. "We work to make that case both by speaking to them about it and, in America, demonstrating that in the way that we act and operate and the way that when US Government officials are out and about we respect each of their capacity to worship in the way that they desire," he said. Pompeo said the US stands as an enormous beacon of religious freedom. "We can always do better. We ought to do that here as well. But we stand strong here in the US for religious tolerance and freedom, and that's an important demonstration to the world of how valuable that fundamental human right can be to a strong and successful nation," he said. In another interview to FRC Radio, Pompeo said it's incredibly important in Trump's administration to make the case and sound the clarion call for religious freedom all around the world. "There are many countries in which religious freedom is not available. We believe that religious freedom is important for every citizen around the world and we want to bring everyone together to discuss how all faiths have the right people, individuals have the right to worship in the way that they choose, or if they choose not to. And every country ought to honour that," Pompeo said. The top American diplomat said that the issue of religious freedom is deeply a human right. "It's important for every individual to ask their elected officials that they consider religious freedom among one of their priorities as they seek to lead and to be part of government service," Pompeo added. Last month, Sam Brownback, the US ambassador for religious freedom, pressed to the Trump administration to impose sanctions on Chinese leaders associated with the country's crackdown on faith groups, The Washington Post reported. Under Brownback's proposal, President Trump could write an executive order, based on Obama-era human rights legislation, telling the State and Treasury departments to freeze the bank accounts and other assets of Chinese politicians involved in the suppression of worship in the atheist Communist nation, the report said. According to human rights activists, China severely restricts the religious practices of Uighur Muslims in Xinjiang and continues to suppress religious rights of Tibetan Buddhists.